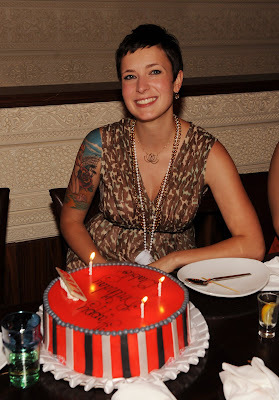 Academy Award winning Juno writer Diablo Cody celebrated her 31st birthday with a Vegas weekend. Cody, surrounded by friends and family, started the party on Friday with dinner in front of TAO’s giant Buddha followed by a table in the VIP moat area in the nightclub. The celebration continued at TAO Beach on Saturday, where Cody sported a gold metallic one piece and snacked on sushi in a cabana throughout the day. LAVO’s private dining room was the setting for her party Saturday evening. Kobe Meatballs and Chianti were topped off with a large red, black and white cake. Cody donned a birthday hat and headed up to the nightclub where at the stroke of midnight she turned 31, complete with shout outs from DJ Reach and more sweets in the form of cupcakes with sparklers. The night was complete as Cody and girlfriends danced on the cat walk.